An individual basket party ticket includes admission to the event, 25 chances on general themed baskets, a door prize raffle ticket, and light lunch. Each additional set of 25 tickets is $5 each. These tickets are good for general themed baskets. Each reserved table can seat 8 people. Please let us know who we should reserve this table under. A sign will be made to reserve your table. Camp PARC purchases the majority of the items for the themed baskets at this fundraising event and also assembles each of the baskets. 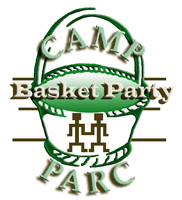 By sponsoring a basket, you can help defray the cost of this event and allow more of the money raised to directly benefit Camp PARC and its programs. As a sponsor you will be recognized on the basket description, on Camp PARC's website, and also verbal recognition at the event. Please list the name of the sponsor as it should be listed in print. Make a tax-deductible contribution to support Camp PARC and its programs.